We would like to present you with an invaluable opportunity to see with your own eyes the process of sword-making, a form of Japanese art recognized and praised around the world. The samurai are frequently said to represent the soul of Japan. It is also said that this soul resides in the samurai's sword, the katana. The sword itself is representative of the world-renowned, detailed workmanship of Japan. The Japanese katana is seen, in some ways, as an object of worship, as well as a symbol of authority. Famous swords have been passed down for many generations through the Shogun (the military ruler of pre-modern Japan), the Daimyo (feudal rulers of the pre-modern provinces), and the Imperial Household. It is said that to lay eyes upon the Japanese katana is to feel the spirit of Bushido (the way of the warrior). Only the samurai warriors during the Edo Period of Japan, also known as Japan's Great Peace, were allowed to wear the katana at their side. The Japanese word "Shinken," which can be literally translated to mean "real sword" (as opposed to one for practice), is now used to mean earnestness and sincerity. This reflects the importance of the sword to the people of Japan. 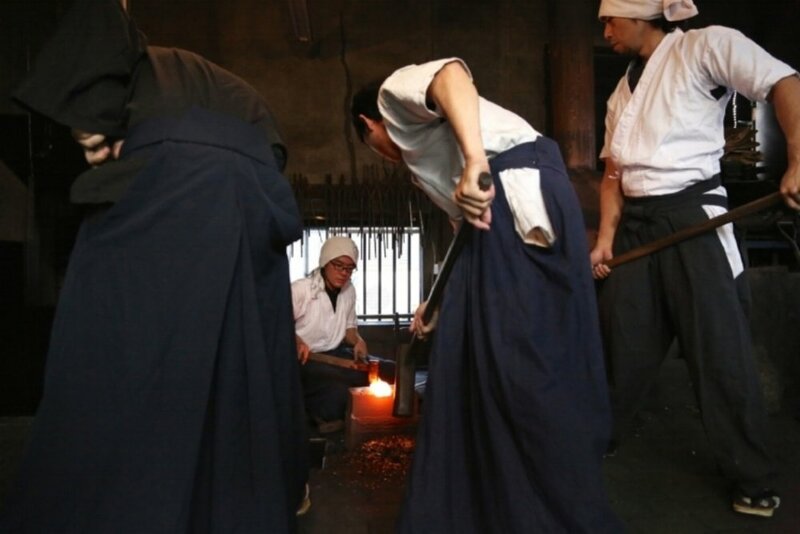 We are invited to visit the workplace of the renowned swordsmith Yoshindo Yoshihara for a rare opportunity to witness him engaging in his craft. Yoshindo Yoshihara is among the most celebrated swordsmiths in the world, whose works of art have been featured around the globe in places such as the Metropolitan Museum of Art and the Boston Museum of Fine Arts. In Japan, two generations of this family have been recognized with the highest honors for swordsmiths, including three nominations for the Sacred Sword of the Grand Shrine at Ise, awarded only once every 20 years. It is our honor to offer you this opportunity to witness Master Yoshihara's craft firsthand. We hope that through this unique experience you may witness the very embodiment of the Japanese soul. We can provide TRANSPORTATION and PROFESSIONAL PHOTOGRAPHY for your experience. For those who are interested in purchasing a katana sword made by Master Yoshihara, please consult with us. We are an official agent, and we work closely with the Yoshihara family. Please note that Master Yoshihara only produces swords through custom orders, and he requires a visit to his atelier to meet him in person before the purchase. Typically, one of his full-sized swords will begin around JPY 5,000,000 (approximately USD 50,000). For more information, kindly fill in the inquiry form using the following link.